A happiness hurricane. A laser light show of the spirit. A one-stop celebration initiation/gyration appreciation station. Koo Koo Kanga Roo has been called a lot of things over the course of the last paragraph. But one thing’s for sure. They are hands down the best funtime dance duo on the planet. Hailing from Minneapolis, Neil and Bryan carefully design each groove so party animals of any age can get funky and bust a move. 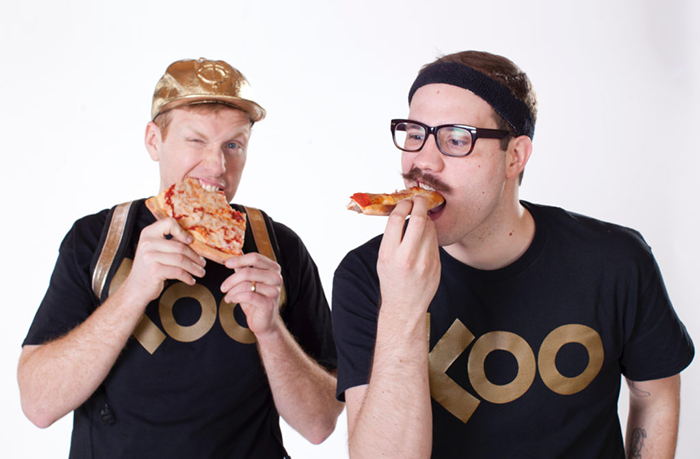 We teamed up with Koo Koo, so now you can learn to play 6 of their most pumped up, positivity packed songs. In October, Koo Koo embarked on a new project: Celebrate This! They love holidays so much, they decided to release a new song every month celebrating a different special occasion for a whole year! December is a big player in the world of holiday months, so their newest installment “Please Come to My Christmas Party” is a real doozy! Check out the project HERE! Rush to your fridge and empty it into the garbage NOW! *Note: if you’ve thrown away any leftover pizza, move it from the garbage into your mouth immediately! Learn how to spell, and how to make your dreams come true! It doesn’t get any better than YOU! Everybody knows somebody who’s cooler than anybody else. Wear your brow-shag with pride! Thanks Koo Koo Kanga Roo for helping us bring your righteous tunes to Pianu!